Businesses have come to accept the fact that social media plays a big role in the Internet marketing campaign of a company. Promoting through the various social networking sites is usually free, and it provides a good platform for communicating with and building positive relationships with a business’s existing clients and prospective customers. This is the reason why most, if not all, companies have accounts on Facebook, Twitter, YouTube, Digg, LinkedIn, etc. – and they use these extensively to promote their business. But let us admit it. Managing these different social networking accounts can be time-consuming and can be a real headache. For any business, every minute is important: one should therefore find an effective way of properly managing all social media marketing efforts. As you begin to create accounts in these different social networking sites, it will be beneficial to create a file with all your information on your various social networking accounts: usernames, passwords, and the goals you want to achieve for each social network site. Do not use your social media applications in the same way. As I mentioned earlier, each of these social networking sites serve a different purpose, and it will be beneficial for you to craft a strategy based on what platform you’re using and on what your objectives are. Let’s take an example: if you’re an online retailer and you want to offer, say, coupon codes to drive your sales, you might want to send out Twitter-exclusive promo codes and discount vouchers offered by your company. Then you can utilize LinkedIn for posting information that is more professional and businesslike (company news, executive hirings, etc. ), as opposed to the more casual and friendly atmosphere on Twitter and Facebook. 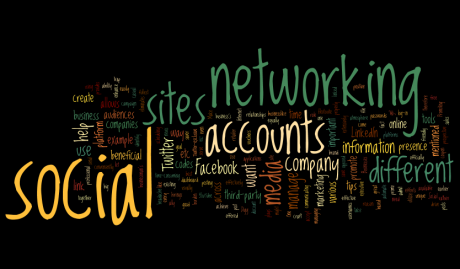 Make a plan on how to link your social networking accounts effectively. Almost all of the social networking sites have the ability to be linked to each other, but this does not mean that you should link all your accounts together and post the same information across all the sites. The goal rather is to help your audiences identify which social media sites you officially have a presence on. Use third-party tools to manage all your accounts. There are a lot of different third-party tools available to manage all your social networking sites. One example is Hootsuite, which allows you to add accounts from different social networking sites like Facebook and Twitter. This is a great time saver as it eliminates the need to log-in and out across different platforms. It also has a unique dashboard where you can manage all your social networking accounts easily and conveniently. It even allows the scheduling of posts, so you can automate some of the tasks to save time. Social networking sites can be a businessman’s best ally: they can help promote your brand and enhance your online presence to relevant audiences. But it is equally important that companies don’t get stuck in the social media trap and the tips mentioned above can help company use social networking to the fullest instead of these being a burden. About the author: AbieL is a free lance writer and professional blogger who also blogs about shoebuy and ebags coupons and discounts in You Love Coupons. Recently she has shared in her blog promotional code ebags and shoebuy codes. Thank you for these tips! I’m pretty sure they are very helpful. Keep going with your work! You are very good! What do you think are the best third party tools other than Hootsuite that can be used to manage accounts? I found this post so interesting and now I’m looking for a tool that I can use to easily update my social networking accounts. Oh! I do need a tool to manage my accounts easier. I have a bunch of accounts in various social networking sites. So this is definitely very useful.